Gardaí investigating the murder of Bobby Ryan in Co Tipperary found Google searches for human body decomposition on a computer taken from the house of the man accused of the murder. 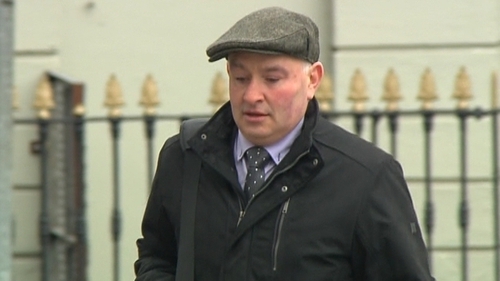 Patrick Quirke, 50, from Breanshamore in Co Tipperary denies murdering Mr Ryan between 3 June, 2011 and 30 April, 2013. The Google searches took place 18 months after Mr Ryan went missing and almost five months before his body was found in a disused run-off tank on land leased by Mr Quirke from Mary Lowry, who was in a relationship with Mr Ryan. A website about the limitations of DNA evidence had also been accessed on the computer, the Central Criminal Court heard. Computers and other electronic devices were taken in a search of Mr Quirke's home on 17 May, 2013. Detective Garda Paul Fitzpatrick from the Garda Cyber Crime Unit gave evidence of his analysis of one of the computers. He examined the internet history and searched for keywords related to the investigation into Mr Ryan's death. The registered owner of the computer was called "User". Detective Garda Fitzpatrick found that over nine minutes on the afternoon of 3 December, 2012, this user had carried out a number of searches relating to human decomposition. The user began at 3.34pm by entering the words "human body decomposition timeline" into a Google search. This led the user to a website called Forensics4fiction.com on which there was an article called "the five stages of decomposition". The same search words led to a website that had an article about how a human body decomposes after death, including "the later stages of decomposition". Another Google search for "rate of human decomposition" led to the user selecting a third webpage, which included links to YouTube videos. These videos included a study of human decomposition carried out on real corpses, but Detective Garda Fitzpatrick said he could not say if they were watched or not. Less than half an hour after the last of this activity, the Detective Garda said he found that Mr Quirke wrote an email to another man in relation to shares. On 30 April, 2013, and the following days, there were searches by the user relating to the discovery of Mr Ryan's body. On 11 May, there was email correspondence between Mr Quirke and Vodafone in which Mr Quirke was requesting a copy of his invoice for June 2011. Two days later, Mr Quirke asked Vodafone for a log of all incoming calls to his mobile from 2-5 June, 2011. The garda said he had also found that a website about how DNA evidence worked and the limitations of such evidence had been visited, but he could not give a date and time - only that it had been visited before 11 September, 2012. Detective Garda Fitzpatrick said there was also evidence of the user actively searching for slurry tankers on donedeal.ie on 15 September, 2012. The detective garda said he had also received a computer taken from the home of Ms Lowry to examine. He said he examined it for certain keywords and Mr Ryan's name appeared in two word documents, one of which was a missing person poster. But he said he got no hits on other keywords, such as "murder" or "decomposition". Detective Garda Fitzpatrick will be cross-examined by Mr Quirke's lawyers tomorrow.